If you’re reading to start selling your products online and don’t know where to begin, a complete e-commerce solution like Shopify might be just what you need. Instead of pulling together all of the pieces yourself, you can use this e-commerce software to create, design, manage and promote your e-commerce business website. Learn more about what’s included with this software below. Right when you get started, you’re given a complete e-commerce package that includes secure hosting, an administrative area and a website. You can set it up on an existing domain, or you can use a new one. The setup process is streamlined and intuitive, and you can start selling your products in just a few minutes. With more than 100 ready-made templates, this e-commerce solution allows you to create the type of site that you want. Several themes are available. Some are geared towards products like electronics while others work best with products like clothing. A variety of free e-commerce templates are offered, and there are premium templates too. After you select a template, you can customize it to your liking. By choosing different fonts and color schemes, you can achieve a unique look that reflects your brand perfectly. You can also upload logos and other images to further enhance the appearance of your e-commerce site. No HTML or CSS knowledge is necessary, but you have complete control over the code and can edit it if you’d like. Once you’ve designed your e-commerce business site to your liking, you can move along to actually adding and managing products. Whether they are physical products or digital products, the process is streamlined and easy. You can import data in bulk from eBay, Excel and Magento. CSV files are supported as well. If you’d prefer to add products manually, you can do that as well. With Shopify, you have complete control over how your products are presented to the public. You can add and edit product descriptions, upload photos and adjust stock levels as necessary. Products can also be grouped into collections or categories manually, or you can use the Smart Collection feature, which allows you to set your own parameters, to group them automatically. Robust shopping cart software is included, and it takes customers through the buying process smoothly and easily. You can accept more than 50 forms of payment, including PayPal. The shopping cart software is Level 1 PCI-DSS compliant, which means that is completely secure. Shipping rates are instantly calculated, and you can track orders at any time. There’s even a way to view abandoned shopping carts and remind customers about them. In addition to setting up and managing an e-commerce site, this software is bundled with powerful promotional tools. A content management system, or CMS, makes it easy to create web pages and blog posts. Customer relationship management, or CRM, features are also included and allow you to form relationships with your customers to provide the best service possible. This turnkey solution eliminates the need to deal with any of the technical aspects of running a traditional e-commerce website. It includes automatic backups, exceptional security that includes 128-bit SSL encryption and free updates. After your 30-day free trial is over, you can take your pick from four pricing levels and plans. Solutions are available for e-commerce businesses of all sizes. Pricing is quite competitive as well. 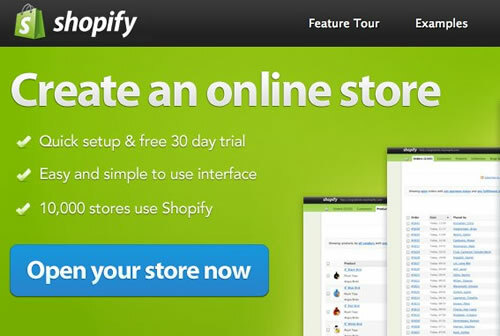 There are many e-commerce platforms out there, and www.shopify.com is a solid choice.